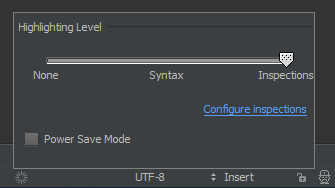 In the latest PhpStorm EAP some of my JS-files have a new icon indicating some sort of binary-type. Inspections seems to be working differently for these files. See attached screenshot. These files have been detected as minified, so inspections have been turned off. If files are really not minified, could you please attach them here or send to me privately via kirill (dot) safonov (at) jetbrains (dot) com so I can see what's wrong? Will be fixed in the next EAP build (beginning of the next week). This one here is also breaking all js-inspections for affected files. I would be thrilled if you could take a look. Let me know if you need a source-file to reproduce the issue.